Yoshi's back with a knee-high entourage! Yoshi takes on a whole new set of abilities depending on whether he's carrying Baby Mario, Baby Peach, Baby DK, or Baby Wario. Hidden goodies like all-new character coins abound, so even after you finish the game, the challenge continues! 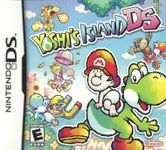 All the lush vistas and perilous paths of Yoshi's Island span two screens now!"